A nonprofit organization that aims to land four astronauts on Mars in 2023 has attracted its first investors for the ambitious $6 billion effort. The Netherlands-based Mars One has secured investments that will help fund conceptual design studies and its astronaut selection program, both of which are slated to kick off soon, officials announced today (Jan. 29). "Raising a few million [US dollars] in the coming months may seem insignificant in the shadow of the pending billions required, but we are taking it one step at a time," Kai Staats, director of business development for Mars One, said in a statement. "These first few bring tangible demonstration to nearly two years in planning. For us, committed funds in this phase of development are an important indicator we are moving in the right direction." The new investments should help get the ball rolling. Mars One officials say they will use the money to fund conceptual design studies — engineering bids from private spaceflight companies that aim to provide the spaceships, habitat modules and other major components of the Mars colony — beginning in the first half of this year. Some of the money will also finance Mars One's televised astronaut selection process, which officials have said will also likely launch sometime this year. Earlier this month, Mars One released its astronaut requirements. Applicants must be at least 18 years old, in good mental and physical health and willing to undergo a training program that will last about eight years. Managing the selection process could prove challenging, as Mars One anticipates receiving hundreds of thousands of applications from people interested in becoming Mars colonists. 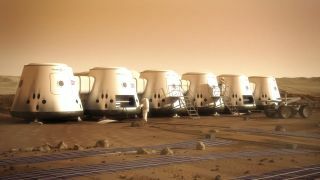 Mars One plans to launch a series of robotic missions between 2016 and 2020 that will build an outpost on the Red Planet. The first four astronauts will arrive in 2023, and more will touch down every two years after that. There are no plans to return these interplanetary pioneers to Earth. The newly announced investments were secured by the Interplanetary Media Group, a daughter company of Mars One that manages the media and intellectual property associated with the Red Planet colonization mission, officials said.